If you are like most homeowners you are probably looking to see what you can add to your home and property to increase its value and enjoyability. A new and increasingly popular idea is building one's own “back yard garden pub shed”. 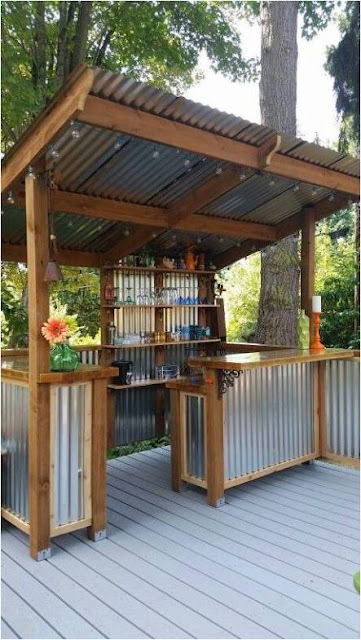 This idea is one part “man cave” and one part utility shed. Often times serving both purposes as it is really up to the imagination of the builder as to which direction they want to go. First thing to access and work around would be the local building codes and regulations. Some places within city limits will have different regulations for building than its rural counterparts so find out which area you are in and determine if you need things such as building permits and inspections. Often times, the latter is not needed if certain standards are met. For instance having a shed that is built on skids will in many places be considered a movable structure and as long as nothing permanent is connected to it such as electrical and plumbing it may be built without permits. Be sure to check out all available information before starting any building project as things can get complicated if you are unclear about the laws. After you have figured out the legal aspect of garden shed you should then consider what kind of theme you want it to have. You will want it to both show off your personality and also be attractive and if there are too many components they may conflict with each other and be a bit of a mess. For those who are more mechanically inclined you will obviously want to have a section of the shed dedicated to whatever project you are currently working on. 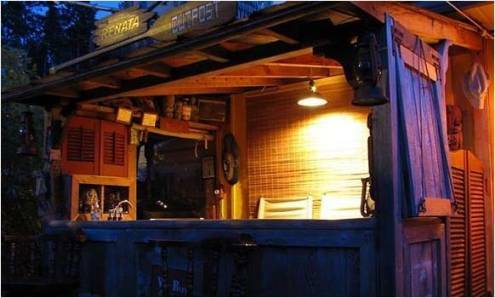 Having a dedicated space to work on your project will make sure that things stay where they are supposed to and will not interfere with the other working aspects of your garden pub shed. Typically the floor shall remain as finished concrete and darks and an easily accessible mini fridge is mandatory. If the rugged nature of a mechanic themed pub shed is not for you then perhaps a quaint garden shed for two is more your style. In the picture below we see an example of what would typically be added to a country cottage. Plain white exteriors and a roofline similar the the main house is a great addition as it will add to the aesthetic of the overall property and will fetch a higher resale value. The close nature of this style is good for a more personal feeling and by being close it fits the flow of having a natural conversation. This style of shed will promote a bright and airy look. 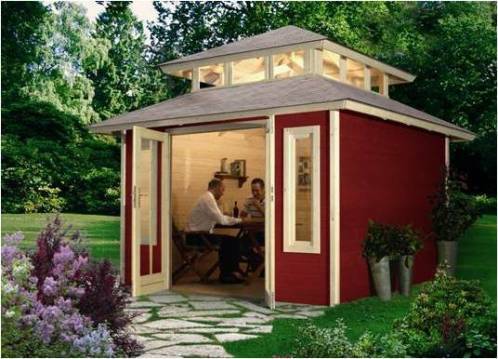 The “Built for two” style of shed is good perfect for two people however should be built to accommodate more. If you don’t have a ton of money to invest in a project like one of these detached shed ideas then maybe you can make use of an existing space. As many homes have covered deck and similar structures already built into the house you can efficiently make use of the space to attain your garden pub goals. Using things such as heavy curtains and a propane heater during the cooler months will provide the necessities expected and but very easy on the wallet. This would be an excellent use of an otherwise used are of your home. 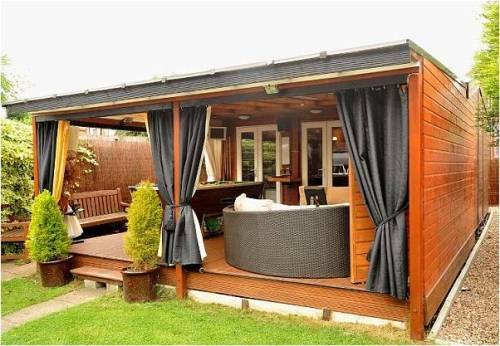 In the example below a covered deck was slightly modified to give a great new space to hang out. This kind of pub shed is the ultimate in being both economical and sleek. The saving of hundreds of dollars by going with corrugated aluminum is hidden by the addition of professional looking woodwork. You don’t need to be too handy if you are going to construct this for yourself as some simple brackets are lagged to your existing deck and the structure is built in place. Both convenient and pretty cheap this style with suit most people. Perhaps the industrial nature of this kind of pub shed might not agree with some people however with the money saved you can treat them to one one your fancier drinks. This one is a fun example for people who like to relax and enjoy nature as almost half of the structure. These style sheds are reminiscent of the mongolian yurt. This style gives up for of the spectacle of other pub sheds and does not have much of a bar to speak of. The floor plan is usually a hexagon and gives a great layout for chairs or couches. Also the walls are constructed as such that it is very convenient to put up hammocks. During the colder months heat could be provided by an electric block heater so if possible be sure to build close to your electric panel as to save costs in running the thick gauged wires need for the outlet. Hopefully you have enjoy this brief selection of previously build garden pub sheds. There are many other examples available online so if this is something you are considering you should have no problem finding help or inspiration.